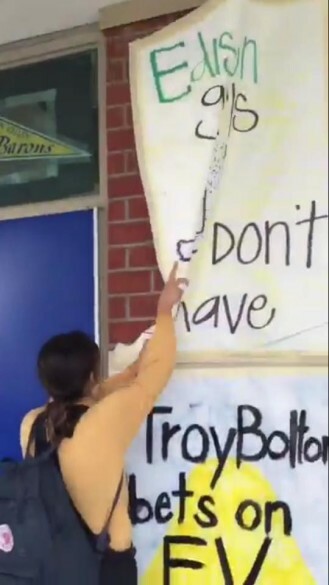 On Tuesday, an upset student removed a Bell Week poster reading “Edison girls don’t shave,” and has since drawn mixed attention from the student body. Since the video has been posted, it has had over 200 retweets and over 400 favorites on Twitter. The video itself was not posted by Abbott, but by a friend. Abbott did not directly talk to an Associated Student Body [ASB] member. Instead, she had two friends talk to an ASB member about it. According to ASB Parliamentarian Lindsay Brown (’16), offensive posters are taken down and replaced if a student notifies supervision, the principal or an ASB member. In addition, Brown explained that posters go through an approval process by the Parliamentarian and Publicity committee to avoid creating offensive posters. Students have responded both negatively and positively to Abbott’s actions. Others feel differently. They believe that by ripping down the poster, Abbott brought attention to other allegedly offensive posters. A still from the video of Abbott taking down the poster on Twitter. According to Senate member Vivian Dang (‘18), in response to Abbott, other students began removing posters. As of now, Abbott has not received any consequences for her actions. She does note that ASB members have apologized to her for the poster.